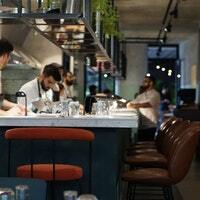 The House Hotels » Table for one, dining solo in İstanbul! Where to eat alone in Istanbul? You’re on a business trip in Istanbul, hungry and in possession of a company credit card! But here is the dilemma – you want a decent meal, but you don’t want to sit in the middle of some buzzed-out restaurant hogging a whole table with only an iPhone for company. What you need is a counter, preferably with a view or a bar or open kitchen, where you can drink your martini and have a taste of some amazing Turkish delicacies. To give you a head start, we have selected for you the best places to dine solo…. Bomontiada is fast becoming an oasis of creative calm in the city. Probably one of its best features is Kilimanjaro, opened in January 2016. The restaurant’s concept comes from a jazz club the owners once visited, and as far as we’re concerned they’ve pulled off that sense of laid-back cool. With interiors designed by Istanbul’s Autoban studio and a menu based on seasonality and abundance, Kilimanjaro is the kind of place that will attract a dedicated following. Through the narrow streets of Pera, the glittering views of the Golden Horn are stretched out before you. Duble, which adds a new interpretation to the concept of mezes, features two separate floors with a dining area and a lounge area. Duble resembles tapas restaurants in Barcelona with its 10 meter long bar on the right, wide wooden tables, and spacious atmosphere. The date and honey shakshuka, sea bass ceviche and samphire with crispy shrimp are both familiar and unusual. The half-baked raw meat entrecote served with oyster mushrooms can seduce anyone. For your first visit to Duble we recommend trying the smoked pepper borani with yogurt, pers rice, smoked grilled tongue served with mustard sauce and oyster mushrooms, and paçanga börek with goat cheese. Ahali Tesvikiye, further revives one of our favorite neighborhoods. Whether you want to sit in the open kitchen where you can watch chefs on the preparation or if you prefer you may sit in the backyard … Ahali Tesvikiye, an appetizer bar, will present you with new interpretations of the pieces you are accustomed to in the 90s Turkish language songs. Are you looking for pink berry dusted eggplant dumplings, truffle meat pie, atom kokorec firing on wood fire … Ahali Tesvikiye will surprise you and make your feast.